Use GOV.UK brand colour to highlight information. Preserve green for success outcomes of services. Remove tabs, don't test well in existing incarnation. Make territory links very clear. Lead with most popular territory. Move calendar link to right to show more content. (not underlined, secondary importance). Change table head, no background, border or boxiness. Table row zebra less high contrast. Show most popular territory first, scroll for others. 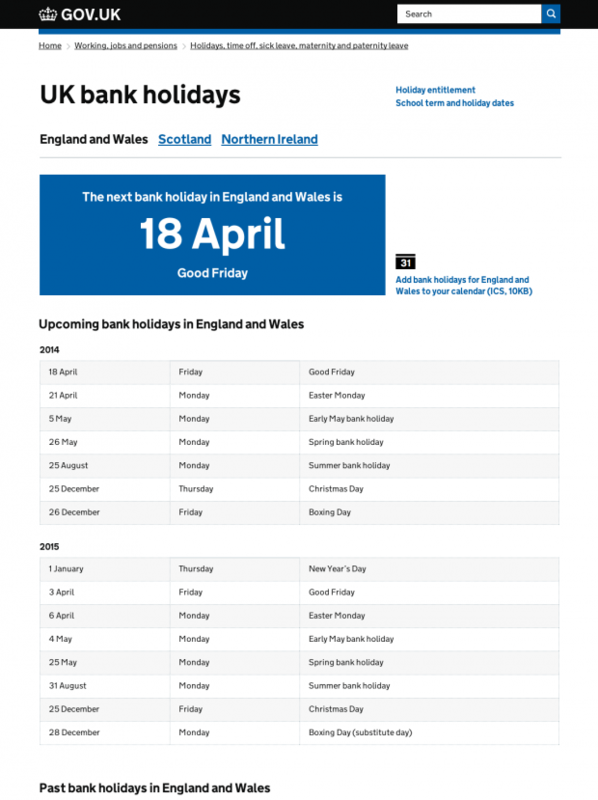 Collapse past and future bank holiday date tables, they are a less important need. No calendar link. Currently broken on mobile and arguably less needed in this context. Breadcrumb trail stripped back just to category this item lives in. Bring more content in to view. I quite often spend some of my free time reading blogs looking for interesting content. I have read this write-up twice and I still don't fully understand what it is you are trying to say. Never the less, and quite weirdly, I enjojed reading it. Sorry if this post is not very clear — probably not very helpful in that it's very concise being a bulleted list and is written in language that presupposes a bit of knowledge of the problem. 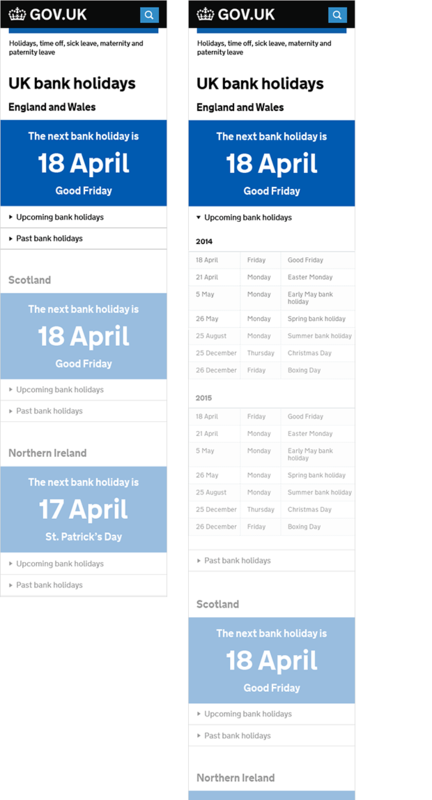 The post is essentially outlining proposed layout and structural design changes to the bank holidays page (https://www.gov.uk/bank-holidays) on GOV.UK. We're rethinking how this page is presented to better help users find the information they are looking for.